U.S. Special Representative for Afghanistan Zalmay Khalilzad visited Kabul and Islamabad last week. The visit came as the United States prepares for another round of talks with the Taliban later this month in Qatar, Doha. In Kabul, Khalilzad advised the Afghan leadership to work on Intra-Afghan dialogue if Afghanistan wants to have a peaceful and inclusive future. “We discussed how the international community can best support them [the Afghan government] in an Afghan-led, Afghan-owned peace process,” said Khalilzad while referring to his engagements in Afghanistan. In Pakistan, Khalilzad met the country’s military and civilian leadership. There were two key messages that America’s special envoy for Afghanistan brought to Pakistan. 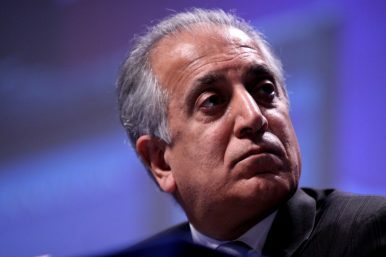 In one message, Khalilzad appreciated Pakistan’s contribution toward the Afghan peace process while in the second message, he told Pakistan to change its policy towards Afghanistan if Islamabad intends to improve its relationship with Washington. Why is the United States putting Pakistan on notice and suggesting an intra-Afghan dialogue for Kabul at a time when the dialogue with the Taliban is at a very crucial stage? There are three issues that clarify this position. First, the United States is under a lot of pressure from the government in Kabul to limit Pakistan’s role when it comes to shaping the peace process. Afghanistan and perhaps the United States too expects Pakistan’s cooperation in only one form: force the Taliban or if needed, punish the Taliban into accommodating Washington and Kabul demands. While Pakistan has helped the United States in engaging the Taliban, the former has refused to force the group into any reconciliation process. Clearly, Pakistan doesn’t want to deteriorate its ties with the Taliban by putting pressure on the group. Moreover, for Pakistan, there is no reason to use force, for any such move can have strategic implications for Islamabad. The Taliban are quite capable of sheltering or providing refugee to militant groups that have targeted Pakistan from Afghanistan. Islamabad doesn’t want this to change in support of extremist groups or political actors that are anti-Pakistan. Second, for the United States to prepare for a graceful departure from Afghanistan, Washington expects the Taliban to agree to some of its key demands. Similarly, the government in Afghanistan also expects the Taliban to recognize the current administrative setup in Afghanistan as legitimate and the government a rightful authority in the entire peace process. Irrespective of the U.S. and Afghan government’s demands, the fact remains that neither Washington’s requests have been met nor Kabul’s calls to meet the Taliban have made any headway. Both states’ inability to succeed in their respective spheres have only added more confusion and complications to the entire problem. Third, Washington and Kabul’s individual interests and approach concerning the peace process have compounded the situation. Two weeks ago, President Ashraf Ghani’s national security adviser accused the U.S. special envoy to his country, Zalmay Khalilzad, of “delegitimizing” the Afghan government by ignoring it from peace talks with the Taliban and acting like a “viceroy.” In response, Washington has stopped dealing with President Ghani’s national security adviser. Kabul maintains that the United States is not specifically concerned about the political future of the current government and is only focused on building consensus on matters that favor Washington’s withdrawal agenda. From Kabul’s perspective, Washington’s focus on finding a way for its own departure and reaching out to tribal chiefs and Afghanistan’s wider political community to engage the Taliban dents political and constitutional legitimacy of the Afghan government. While Kabul may not like Washington’s current approach, it doesn’t have much of political clout across the country to convince Washington to take up a new approach that might place the Afghan government in a key interlocutor role. The next round of peace talks, which are due to begin in Doha later this month, are not likely to change much when it comes to the Taliban changing their position. The prevailing frustrations, shared accusations, and differences among the stakeholders are expected to remain in place for the foreseeable future. However, the fact that peace talks have continued on for months can be called a progress itself, even though there is little to no hope of a major breakthrough anytime soon.